These are a few whom you will likely recognize of the many who have already bought Moon Land In order, they are: John Travolta, George Lucas, Martha Stewart, Tom Hanks, Tom Cruise, Mick Jagger, Nicole Kidman, Clint Eastwood, Harrison Ford, William Shatner. 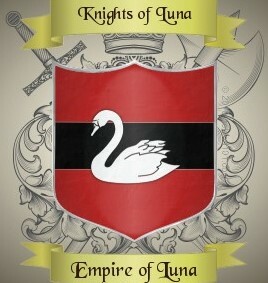 His Imperial Majesty King Roman purchased more than 8000 square metres (over two acres) of Moon land between 1st October 2013 and 1st July 2014, and he created the micronation Moon Kingdom of Alba on Copernicus and micronation Moon Kingdom of Kathon Manilius They are named after his favourite film star Jessica and his beloved mother Katherine. 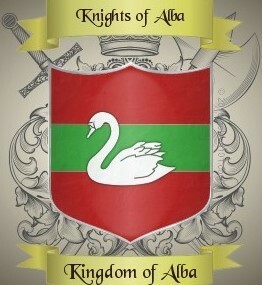 Alba also means Scotland (as well as white/pure). There is a US bill in the pipeline regarding Space Commercialization Profits, meaning that, if/when it passes, those who have already purchased Moon Land may be able to negotiate payments for rent or sale of Moon land they own, including the mineral rights also. US astronauts landed on the Moon during the period 1969 - 1972, over 50 years ago! NASA has plans to return there around 2020, by which time Elon Musk expects to have the Moon colonised! 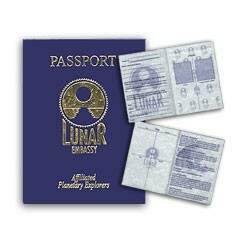 This means that you may be able to visit your Moon land and King Roman's Kingdoms. Through Japan's Serene mission we now know of caves on the Moon to provide shelter, possibly oxygen, water, even food. There are other surprises awaiting, like dust storms on the periphery, gas vents on the surface, and solution of the Transient Lunar Phenomena - strange lights in Aristarchus (and elsewhere) that were supposed to be investigated by Apollo 11 in 1969. This has still not happened. Micronations are not subject to the Outer Space Treaty because micronations, although generally acknowledged, are not officially recognized by the United Nations, just as micronations on Earth are not recognized. 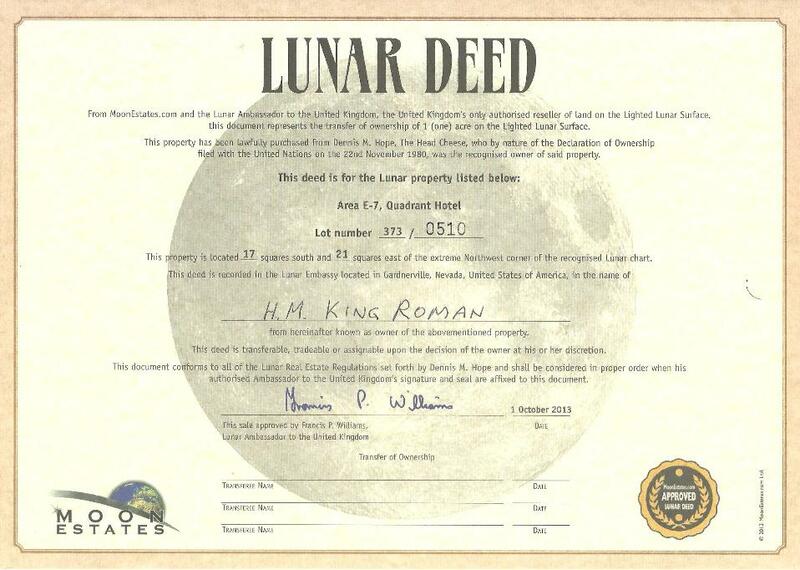 Would you like to join Moon landowners like King Roman, three US presidents, around 675 well known celebrities, and around 15 principals from Star Trek, while there is still opportunity? If you wait, you may find that the Outer Space Treaty is altered to exclude individuals. In which case the opportunity to purchase any valid MOON Titles may disappear, leaving only those who had the foresight to take the opportunity when it was presented to benefit from their MOON land and associated mineral and other rights. If you wish, you can obtain from King Roman a Lunar Knighthood (Sir or Lady) for a contribution of $250 and become a member of one of the Moon Kingdoms, Alba on Copernicus or Kath on Manilius. While we tend to think of our Moon as a dry, dusty, dead world, nothing could be farther from the truth. Our Moon is a surprising, wonderful, and yet perilous place - like Earth. Our astronauts were, in fact, very fortunate to survive their 1969-1972 Moon landings. This is very likely one of the hidden reasons the moon landing missions were suspended 35 years ago. Myth #1 - The manned moon landings were faked. Conspiracy theorists still imagine that NASA faked the Moon landings, at the behest of the president, to ensure that America would be first to land on the Moon. After all, the Space Race with Russia had to be won. In 1978, the sci-fi movie classic "Capricorn One" showed how a fake manned mission to Mars could be made to look real on film. However, the truth is that the final Apollo mission in December 1972 left behind special scientific equipment, which is being utilised daily by the Jet Propulsion Laboratory in Houston, Texas. They are analysing, by means of laser beams aimed at a special mirror left on the Moon, the rate at which the Moon is regressing from the Earth. This latter has already been calculated to 3.82 centimetres annually. Of course, this figure will increase as the gravitational attraction between Earth and Moon decreases. Myth #2 - The astronauts' bootprints will remain undisturbed forever. Since the Moon landings in 1969-1972, there have been further discoveries made about our Moon. Amongst these is that the dusty Moon surface is less than stable. There are forces at work (see below) both inside and also on the surface of the Moon. These forces do not guarantee that anything on the surface will remain undisturbed, including the astronauts' bootprints. Myth #3 - The Moon is a dead world. Reality is that the Moon has an active core with a central temperature of 1,500 degrees Centigrade, which causes heat stresses within the Moon. These in turn produce other effects not previously recognized (see below). The result is yet further hazards for astronauts. Myth #4 - The Moon has no atmosphere. Admittedly the Moon, with only point 165 of the Earth's gravity, cannot hold onto a thick atmosphere of air such as we breathe on Earth. Nevertheless, the Moon does have a thin, tenuous atmosphere. The Moon's atmosphere comprises traces of helium, neon, hydrogen and argon. Myth #5 - There is no volcanic activity on the Moon. It is true that the Moon does not have volcanoes as on Earth. Nevertheless, there is surface activity prompted by heat and gases within the Moon. Thus an astronaut could well find him/herself goosed, and even envelopped in a cloud moon dust, by a sudden vent of hot gas breaking through - and thereby disturbing - the surface dust. Myth #6 - There are no earthquakes on the Moon. In fact, moonquakes and tremors are quite a common occurrence, again because of the interior heat and activity of the Moon's core. The foregoing are only a few of the surprises and perils which may greet any astronaut who lands on the Moon. Myth #7 - It is safe to walk on the Moon in a spacesuit. Actually, even apart from the forementioned hazards and the unshielded UV rays from our Sun, the Moon is bombarded by asteroids, any of which could be deadly. Most asteroids are no bigger than a grain of sand. Yet they travel through space at 13 kilometres per second. And, because the Moon's atmosphere is so thin, they do not burn up as they would in Earth's atmosphere. As a result, they may penetrate the surface of the Moon, or an astronaut, very much faster than a speeding bullet, and create serious damage, even death. Myth #8 - There is no water on the Moon. In 1998, twenty six years after the final lunar landing was made (1972), the Lunar Explorer discovered water ice on the Moon. The water ice is protected from the up to 124 degree Centigrade (above boiling point) lunar surface temperature, because the water ice is shielded inside craters at the Moon poles. Not only is the presence of water ice an indication of the possibility that some form of life may exist on the Moon, but such craters may also provide possible habitats for our first Moon base. Myth #9 - The Moon is too small to be the subject of any records. Although the Moon is only a quarter the diameter of the Earth, it boasts the presence of the largest crater in our solar system. 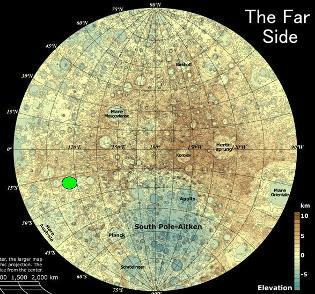 The crater is the South Polar Aitken Basin, which is a whopping 2,250 kilometres across and 13 kilometres deep. Myth #10 - There is nothing more to learn about our Moon. (a) In 1969, prior to the first Moon landing, NASA catalogued hundreds of strange, coloured lights which had appeared on the Moon surface during the past century. Many occurred around the crater Aristarchus, as well as elsewhere. The source of these lights was not elicited during the several Moon missions from 1969-1972. Some of the light episodes last for up to two hours, and pulsate. They continue to occur, without satisfactory explanation. (b) Inexplicable also are the dust storms which appear on the Moon. These have been principally sighted around the Moon's circumference. There is no apparent basis for these storms, because the Moon atmosphere is so tenuous. These constitute yet another paradox about our nearest neighbour the mysterious Moon. In 2004 NASA initiated plans to revisit the Moon. 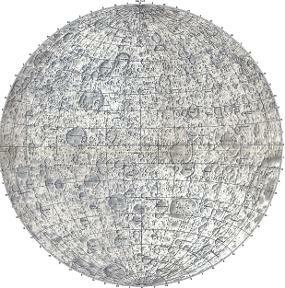 It is reasonable to believe that the most suitable area to build a Moon base will be within one of the polar craters, where water is available to drink and for hygiene, to grow edible and oxygen producing plants, and possibly (as water comprises hydrogen and oxygen) to provide oxygen to breathe and fuel for propulsion. It would definitely appear that further Moon landing missions will have to be very much more carefully planned, in the light of what we now know about our nearest neighbouring world. Can you REALLY acquire MOON Titles and MOON Land? Elon Musk Unveils Ambitious Plans To Colonize The Moon And Mars Within Next 7 Years!